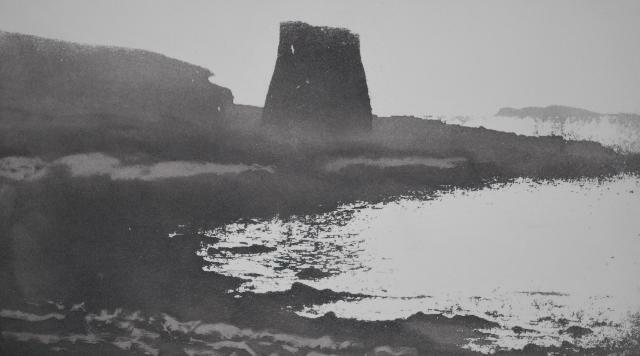 For the past three years, English artist Norman Ackroyd, CBE and Royal Academician, has been visiting locations on the chain of islands that stretches from the Outer Hebrides in the Atlantic Ocean, to Shetland, the UK's outermost reach in the North Sea. Always arriving by boat, Ackroyd paints and sketches what he sees on approach. Back in his studio, he uses these drafts as blueprints for creating aquatint prints. 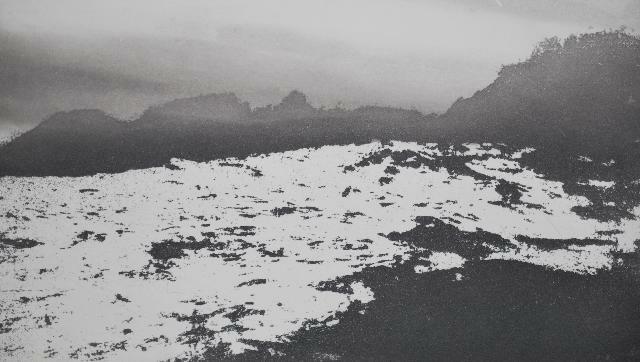 This method, which involves using acid to burn images into metal plates, rubbing the plates with ink, then printing their surfaces onto paper, achieves a rare visual quality that somehow manages to render the artist's whole sensory experience of being at sea into his works – the taste and smell of the salt air; the sounds of seabirds; the irreducible depth of a mid-summer horizon – it’s all present. When I phoned Ackroyd at his South London home on a Saturday morning last November, I could faintly hear his two assistants busying away in the background, packing up works to be shown in his winter exhibitions. Then, just as he began to tell me about his recent work, he stopped to declare that a young kestrel had landed for a rest by his window. Such is the influence of nature over the artist, that it took some time to get him back to discussing his work. Ackroyd’s most recent collection, Shetland, was completed after a series of trips he made in 2011. The previous year, he travelled to North Rona, Sula Sgeir and the Flannan Islands; and the year before that he stayed in a bothy on St. Kilda. "I've always been fascinated by the edges, the fringes", he explains. "They’re dense with history and there's an enormous culture and history present in the islands around the British coast. It's wonderful to go to these places, see them appear on the horizon and watch those fantastic rocks coming out of the mist." The history and culture of the islands is of particular interest to Ackroyd, especially those that were once inhabited. Speaking about his visit to the Flannan Islands he describes visiting Eilean Mòr's lighthouse, site of one of the most enduring island mysteries of the modern era. "We climbed up old staircase, which is all crumbling", he said, before relating the story. On the 15th December 1900, a steamer en route from Philadelphia to Leith passed the Flannan lighthouse and noted that the light was out. For a beacon manned by a three-strong team of men, this simply wasn’t right. Treacherous weather conditions meant that two weeks passed before a relief boat was able to land and investigate. A search party went ashore to discover the main door to the facility left ajar, and upon entering found an uneaten meal on the kitchen table, one waterproof suit hanging on a hook in the wall, and a chair turned over on the floor. All three men were gone. Their bodies were never found. Several theories were put forward for the disappearance at the time. Were the men tempted into the sea by mermaids? Were they were abducted by foreign spies? Did one keeper kill the others before throwing himself into the sea? Folktale, murder and subterfuge aside, a more prosaic and plausible explanation is that the third man left the lighthouse in an attempt to help his colleagues who had got into trouble outside, and in the end all three were lost. Ackroyd tells the tale with the chill of a man who has learned to let impressions ferment with the passage of time: "There's this incredible history going back through the islands, a continuous layering" he said. "I leave thinking I've only just started to scratch the surface."